Let’s face it as long as teenage boys and sports exist then the bench press is not going anywhere anytime soon. 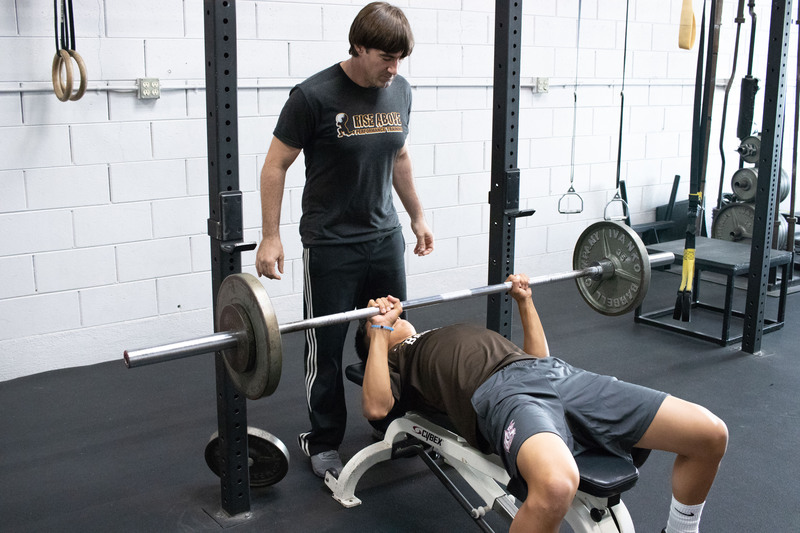 I have nothing against the bench press, it is a great upper body developer for size, strength and power; I just don’t hold it as the gold standard for increasing athletic development. Like I said, it is not going away anytime soon and I still use it within my athletes’ training programs, where appropriate, so it would be wise of us to dissect the movement and make sure we are technically sound to get the most out of this exercise in terms of strength and safety. When I worked in a commercial gym I would watch young athletes claim the bench press, load their weight and get ready to lift. Right away I could tell by their set up whether or not the weight would come back up or if one of their friends would be shrugging the bar up for them. The set up is the foundation for success and just like any other structural foundation, if it is weak it will not support the weight and overtime it will all come crashing down. For proper set up, I prefer that your eyes be directly in-line with the bar you are about to press. Many athletes are too far back and line up their chest with the bar which may cause them to hit the pins when they press. Your feet should be rooted into the ground. Think about screwing them into the ground to get your body tight and support the load you are about to lift. You also want to make sure your hips are in contact with the bench at all time especially when you are doing the pressing movement. Hand spacing is a matter of personal preference. Find a distance where you can be the most powerful and maintain proper technique. You can get a rough idea about where this is by standing up and placing your arms in a position where you would push someone who weighs 100lbs. more than you. This is most likely the spot where you feel the most powerful and should work well for bench pressing. Use the marking on the bar to make sure you are aligned in the center of the bar and the hands are evenly placed. I also prefer to wrap the thumb around for both strength and safety verses a false grip. Keep your wrists are straight as possible when gripping so the bar does not roll back in the hand causing the weight to be behind (unsupported) the forearm. If you want to save your shoulders, you have to think of them like your feet; you must screw them into the sockets so they are tight. The biggest mistake I see are people bench pressing with shoulders that are not packed and the bar is wavering around. Not only will you not press much weight you are putting your shoulders in a perilous position and setting them up for potential injury. Tension is king especially when trying to move heavy weight. Now that you have your foundation set when you unrack the weight (having a spotter preferred) it is important to get tight and your do this through creating tension through your muscles. Drive your feet into the ground, contract your glutes to engage your legs and protect your back and grip the bar as if you were going to crush it to turn on the muscles of your shoulders and chest. Does this sound a bit too dramatic? Maybe so however if you want to press your personal best having flaccid muscles will not get the job done. When you are creating tension, you are getting as many muscles fibers of your body involved helping you achieve the lift. Simple science here; if you have more muscles helping, the stronger and more successful you will be at the lift. Another novice move is focusing solely on the concentric (upward) portion of the lift. It is not uncommon to see inexperience lifters literally drop the weight too fast towards the chest, bounce it off and try and press it up. I tell all of my athletes to think about lifting in two directions. In the bench press you want to set up properly and use your back muscles to literally pull the bar towards the chest. This creates tension in the pressing muscles which is like a loaded spring that can be used to drive the weight back to the top. This type of lifting technique may feel unnatural and you may even feel weaker at first because you are not used to lifting in both directions. Give it time with light weight and plenty of repetitions to solidify your technique and you should see your weight fly up in a few weeks. There you have it. Practice these techniques and find yourself being more successful in the gym, prolong the life of your joints and ultimately become a better athlete.